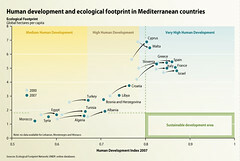 The long history of the Mediterranean has led to a diversification of political and governance approaches, a broad range in economic development, and a diversity of social systems, all of which is reflected in the levels of development and the ecological footprints of the Mediterranean states. The ecological footprint is a measure of human demand on the Earth’s ecosystems and it represents the amount of biologically productive land and sea area necessary to supply the resources a human population consumes, and to assimilate associated waste. Mediterranean countries can be separated into two groups: 1. middle-income countries, with low Human Development Indices (HDIs) and small ecological footprints plus substantial progress in HDI, concentrated in the southern and eastern Mediterranean and on the eastern shore of the Adriatic Sea; and 2. high-income countries, with high HDIs and large ecological footprints. 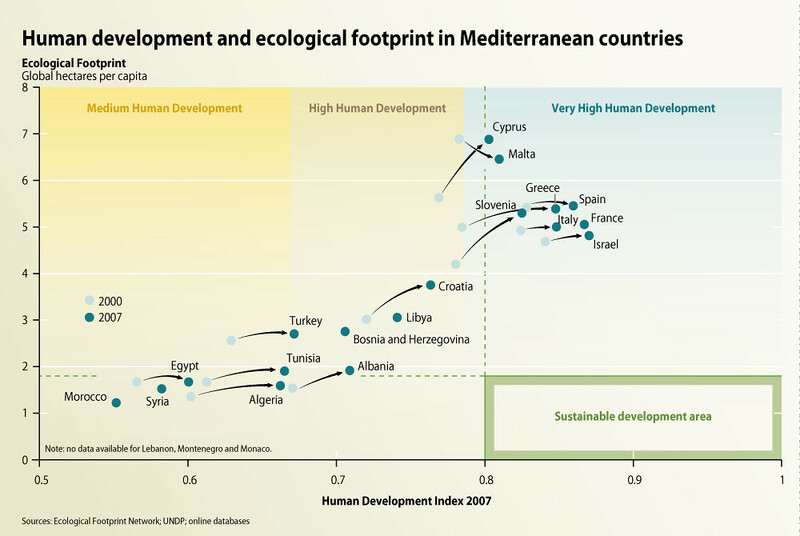 These are the EU Mediterranean countries and Israel.